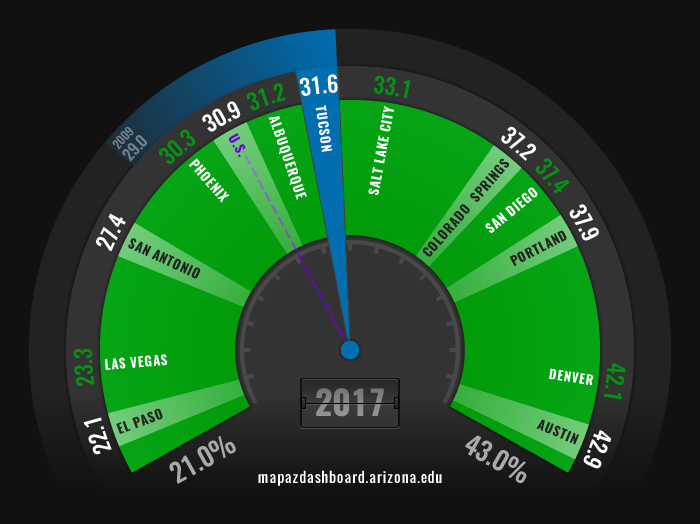 The four-year college attainment rate in the Tucson Metropolitan Statistical Area (MSA) was near the middle of the pack in 2017, compared to 12 western MSAs. The share of the population age 25 and older with a Bachelor’s degree or more was 31.6% in Tucson. That was far below the Austin MSA, which ranked first at 42.9%, but well above the El Paso MSA, which ranked last at 22.1%. Tucson’s four-year college attainment rate has increased by 18.4% since 2000. Educational attainment is one critical driver of long-run income, job, and population growth for nations, states, and local areas. More broadly, regions with higher concentrations of highly educated residents tend to perform better across many socioeconomic indicators, including the crime rate, poverty, productivity, unemployment, and others. In addition, less educated residents also tend to earn higher wages in regions with a larger concentration of college graduates. In 2017, the Tucson MSA had a relatively small share of residents who reported a high school degree as their highest education level (22.5%) when compared to the U.S. (27.3%). In contrast, Tucson posted a relatively large share of residents with some college education, but no degree (25.3%) when compared to the nation as a whole (20.8%). Further, Tucson had a large share of residents with a graduate or professional degree, at 13.4%, compared to 11.8% for the U.S. In part, this reflects the presence of the University of Arizona in Tucson. Educational attainment rates vary significantly by race and ethnicity. College attainment rates were highest in 2017 for Asian residents of Tucson, the state of Arizona, and the U.S., while rates tended to be lowest for American Indians, Hispanics, and other races. The college attainment rate for Hispanic residents in the Tucson area was 15.3% in 2017, which was above the Arizona rate and about equal to the national rate of 15.2%. However, the college attainment rate for Hispanics in Tucson was far below the rate for non-Hispanics at 38.7%. College attainment rates also vary strongly across age groups. In 2017, the share of residents with a Bachelor’s degree or more in the Tucson MSA was highest for the 65-and-older age group, at 34.6%. The college attainment rate for young working-age Tucson residents (ages 25-34 and 35-44) was below the national average in 2017, while for older age groups, Tucson college attainment rates were higher than the national average. In part, this reflects retiree migration to Tucson, which has favored more highly educated individuals. The Tucson MSA college attainment rate has increased since 2000, but the pace of growth was relatively slow. 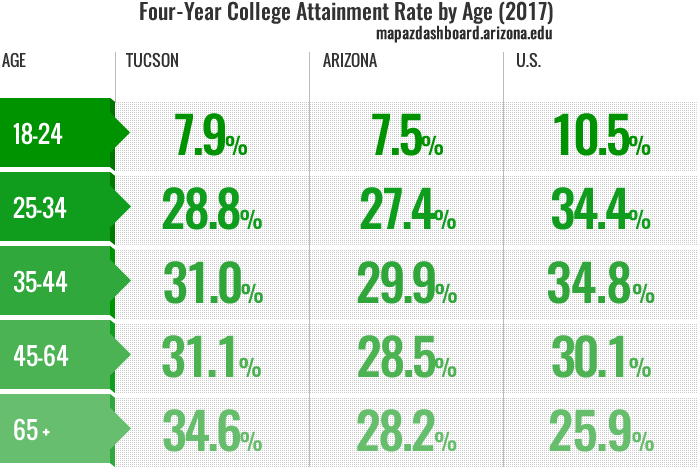 Tucson’s college attainment rate rose from 26.7% in 2000, to 31.6% in 2017, an increase of 18.4%. That was slower than the pace set by Arizona (20.9%) and the U.S. (26.6%). Educational attainment reflects the share of the population age 25 and older with a given level of education. Respondents report the highest level of education completed. The data come from five-year estimates for 2009 and 2017 from the U.S. Census Bureau’s American Community Survey (ACS). Note that the ACS five-year estimates are a rolling survey taken over five years therefore, they are only comparable on a five-year interval. Data for 2000 are drawn from the 2000 Census Summary File 3.